Like the miscellaneous uniform polychoron category (Cat 20), it consist of several small mini-categories. So far there are six mini-categories here: Diminished, snub containing, ike snubs, decasishis, duoprismatic blends, and blended tessic snubs. These scaliforms start with a uniform polychoron and then chop off some of their vertices. Bidex - (BI dex / bi24 diminished 600) - cells are 48 teddis, teddi is the tridiminished icosahedron. This object is convex and has directional tetrahedral swirlprism symmetry - its an unusual shaped dice! Bidex was discovered by Andrew Weimholt in 2004 and it got a bit of attention amongst the polychoronist. It's verf is a 6 sided chiral faceting of ike with 4 isosceles triangles and 2 trapezoids. Bidex has 72 vertices and it is orientable. Birgax - (BIR gax / bi24 replinished grand 600) - cells are 48 targis, targi is the trireplinished gike, the conjugate of teddi (looks quite stellar). This object hasn't gotten as much attention as bidex. It has 72 vertices, and it's verf is a chiral object with 4 flat isosceles triangles and 2 crossed trapezoids. It is orientable. These are the snubs that contain snub polyhedra for cells. Shi - (SHE / snub 120-cell) - cells are 120 sesides and 1440 stappies (star pyramids), it has 1440 vertices. The verf is a lampshade shaped object consisting of a star at the top, 5 isosceles hexagons joining the star and each other in a star fashion, then finally 5 triangles to fill the voids - it has a pentagonal shaped opening at the bottom which represent 120 pseudo-sissids. Shi was co-discovered by Mason Green and myself in summer 2005. It is non-orientable and only a shell of it exists in neo-filling. Rashi - (RASH shee / retrosnub 120-cell) - cells are 120 sirsids and 1440 stappies, it has 1440 vertices as well as 120 pseudo-sissids. This is none other than the 4-D version of sirsid (yog-sothoth). The verf is a spike-festival resembling a squashed gissid - actually it only has 10 spikes with a hollow pentagonal base acting like a stubby pedistal - the verf would make a great Christmas tree ornament. 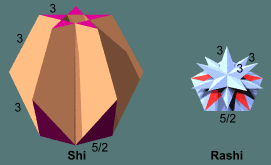 Rashi is a horrendously spiky object and is non-orientable, it likely has a hollow center. It was co-discovered by Mason Green and myself in summer 2005. Here are some snubs which contain atleast one of the following: ike, gad, sissid, or gike. Prissi - (PRISS see / prismatorhombisnub 24) - cells are 24 ikes, 96 trips, 24 tuts, and 96 tricus. It has 288 vertices. The verf is a sort of pentagonal wedge which is actually hiding inside padohi's verf. Prissi is convex and can be found by chopping all but 288 vertices off of padohi. Richard Klitzing discovered it in September 2005, while Wendy Kreiger verified it's scaliformity. It has the symbol ss'ox. It is orientable. Prarsi - (PRAHR see / prismatorhombiretrosnub 24) - cells are 24 gikes, 96 trips, 24 tuts, and 96 tricus. It has 288 vertices and has the symbol ss"ox. The verf is a sort of crossed up star wedge which can be found inside gidipthi's verf. I found this one after investigating Klitzing's prissi in October 2005. It is orientable. Disdi - (DIS dee / disnub dis24) - cells are 24 sissids, 24 gads, 24 scuffis, and 24 scufgis. Scuffi and scufgi are trigonal Klitzing facetings of ike and sissid respectively, both containing 7 triangles, scuffi has 3 pentagons, scufgi has 3 pentagrams. Verf has 3 of each of the following faces: sombraroids (hat like pentagon), long isosceles triangles, small butterflies, pentagons, piscoids (fish like pentagon), fat isosceles triangles, large butterflies, and pentagrams. Disdi is in the sadi army with same symmetry, it was found by Mason Green in January 2006. Mesdi - (MESS dee / medial snub dis24) - cells are 24 gads, 24 sissids, and 96 sipstars (rappisdi verf shape). Verf is the alternated sipstar. It is in the rappisdi regiment with sadi symmetry. It was found by Mason Green in January 2006. Here are some finds among the compound of ten sishis. Sistakix - (SIS ta kix / small snub 3600) - cells are 3600 'two-stip blend's. The two-stip-blend is a blend of two star prisms - it resembles gadsadox's verf (gadsadox is the leader of the gidtaps). Sistakix has 600 vertices (same as hi). The verf is a blended compound of two paphicki verfs (paphicki is the small prismasaurus). This object might be excluded by some polychoron definitions since it is fissary. I found this one in late October 2005. Gastakix - (GAS ta kix / great snub 3600) - cells are 3600 'two-pip blend's. The two-pip-blend is a blend of two pips and resembles sadsadox's verf (sadsadox is the leader of the sidtaps). Gastakix has 600 vertices. The verf is a blended compound of two paphacki verfs (paphacki is the great prismasaurus). This object is also fissary. I found it in late October 2005. Very similar to sistakix and gastakix are the compounds of 10 paphickis and 10 paphackis, I noticed these compounds several years before but didn't consider the blended versions (these two scaliforms) until 2005. These are formed by blending 4 of the same tessic polychora together to get something with octagon^2 symmetry. Otbott - (OT bot / octagonnally tetrablended truncated tesseract) - cells are 64 tets and 16 tutics (TOO tic - the blend of 2 tics) - this is the blend of 4 tats. It has 128 vertices, it's verf is a butterfly wedge. It was discoverd by Andrew Weimholt in early March 2006. 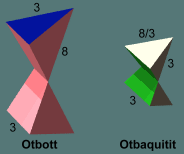 Otbaquitit - (ot BACK wit it / octagonnally tetrablended quasitruncated tesseract) - cells are 64 tets and 16 tuquiths (blend of two quiths) - this is the blend of 4 quitits. It has 128 vertices, its verf is a butterfly wedge. It was found by Mason Green after otbott was found. These are the result of blending normal tessic polychora to get snub tessic polychora. These were originally mistaken for swirlprisms, so I recently updated their names on March 10, 2012. Another recent find is that scabtitho and stuthit aren't truely scaliform, even though they have only one type of vertex figure. What happens with those two is that half of their vertices are above tetrahedral pseudo-cells and the other half are only above tetrahedral cells. Sobthex - (SOB thex / snub blended truncated 16) - cells are 64 tututs (TOO tut - the blend of two tuts) and 64 octs (which double up in a positive-negative pair). It has 192 vertices and has tessic symmetry. Its verf is a blend of two square pyramids, which looks similar to a butterfly wedge. It is tame and orientable. Discovered in mid-2006 by Mason Green, previously called spobthex for swirlprismatic blended thex. Sobtitho - (sob TITH tho / snub blended truncated tesseractihemioctachoron) - cells are 64 tuts, 64 thahs, and 16 tutoes (TOO toe - blend of two toes). It has 192 vertices and belongs to the sobthex regiment, it has an ionic tesseract symmetry. Discovered in mid-2006 by Mason Green, previously called spobtitho, also mistaken as a swirlprism blend. This one is wild and non-orientable. Stuthit - (STOO thit / snub tetrakis 32 hemi 32) - cells are 32 tututs, 32 tuts, 32 octs, 32 thahs, and 16 toes. It has 192 vertices and belongs to the sobthex regiment. It has chiral demi-tessic symmetry. I found this one on Feb. 8, 2007, it was originally named sputihi (sp for swirlprism, i's for 24 (now 32) - had the wrong count). This one is wild and non-orientable and is pseudo-scaliform. Scabtitho - (SCAB tith tho / snub cisblended truncated tesseractihemioctachoron) - cells are 32 tututs, 64 thahs, and 16 tutoes. It has 192 vertices and belongs to the sobthex regiment. This one was suspected to exist back in 2006, but we weren't sure at the time. I took a closer look at it and noticed that even though their vertices have the same shape, they come in two sorts, so this shape is pseudo-scaliform. It has demi-tessic symmetry and is tame and non-orientable. The following are self-conjugate: disdi, mesdi, sobthex, sobtitho, stuthit, scabtitho. The following are conjugate pairs: bidex-birgax, prissi-prarsi, sistakix-gastakix, otbott-otbaquitit. The following are quasi-conjugate pairs: shi-rashi.